2002. Acrylic on stretched canvas. 36"x48". This painting was created for a collector of space art who wanted me to "tell the story" of the Apollo program. I am grateful to Alan Bean for granting me permission to use the figure of one of his astronauts in this illustration. 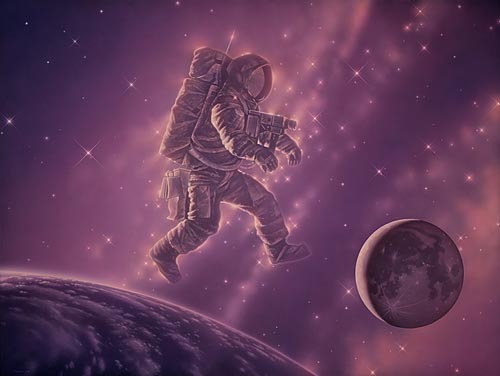 My rendering is a mirror-reversed image of the bounding astronaut in his painting "Fast Times on the Ocean of Storms".